Here in Barcelona we are very fortunate to have a number of open spaces, offering havens of tranquility away from the hustle and bustle of daily life. One such location is Montjuïc – the prominent hill wedged between the Poble Sec neighborhood and the Mediterranean Sea. But Montjuïc is so much more than just a beautiful location, with spectacular views of the cityscape and Maresme coastline, to be explored on foot during a hot, sunny day. Over the centuries Montjuïc has drawn people to it for a number of reasons. Perhaps most revealing is the name itself, which in Catalan literally mean “Mountain of the Jews”, as this was the location of the Jewish cemetery in medieval times. In the twentieth century it was the focal point for the 1929 International Festival, and the 1992 Barcelona Olympic Games. Today Montjuïc is also home to a number of galleries, museums, music and sporting venues, and even a castle, making this part of the city a great place to visit throughout the year, come rain or shine. Here is a guide to just some of our favorites places to be found on this picturesque and easily-accessible mount. When entering the city of Barcelona from the airport, the first major square that you will come across is Plaça d’Espanya. If you look to your right, between the two, matching towers (known locally as the Venetian Towers because they were designed in the style of the bell tower of St. Mark’s in Venice), you will see the elegant Palau Nacional, which is home to National Art Museum of Catalunya (Museu Nacional d’Art de Catalunya or MNAC for short). 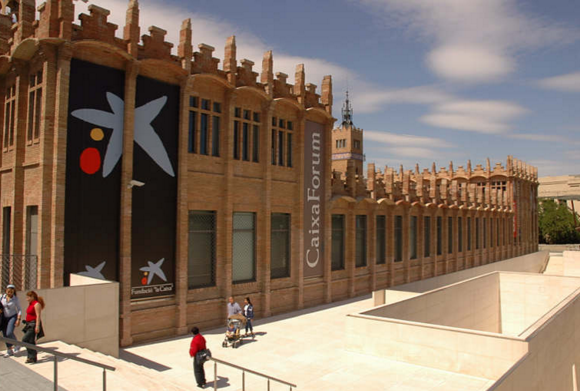 This handsome building is a crammed full with exceptional examples of Catalan art and design. It is perhaps most famous for its collections of romanesque frescoes. Only a stone’s throw from the MNAC, the Caixa Forum offers many and varied exhibits within this contemporary arts gallery. Take time to enjoy the building building itself, which was was once a textile factory, and was built by renowned Catalan architect Josep Puig i Cadafalch, who designed such modernisme gems as Casa Amatller on Passeig de Gracia. More mordern art, this time a temple dedicated to one of the leading lights of the 20th century modern art world – Barcelona’s own Joan Miró. Created as part of the 1929 International Festival, the charming, formal gardens center around an amphitheater, which host a variety of open-air events and concerts during the summer months, as part of the annual El Grec festival. The fact that the Barcelona boomed thanks to the investment bestowed upon the city by the 1992 Summer Olympic Games is well documented. We have even dedicated a blog post to the subject! However, let us not forget that at the heart of the Olympics is competition through sport. Around the city there are a number of venues that serve as reminders of the games, when Barcelona was in the global spotlight. For those interested in the Olympics story perhaps a good starting point is visiting the Museu Olímpic i de l’Esport Joan Antoni Samaranch de Barcelona (the Juan Antonio Samaranch Olympic and Sports Museum of Barcelona). Afterwards we recommend that you also take in the Olympic Stadium and during the summer months soak up the sun poolside at the Olympic diving pool. Thanks to its elevated position, Montjuïc’s naturally strategic position is obvious. Historically this has been beneficial to those occupying this the castle, who were either looking out for insurrection amongst the populace below, or any threats approaching via sea. It seems unsurprising therefore that a fort, which subsequently developed into the castle that still stands today, has been in place on Montjuïc since the 1640. Over the centuries the castle has served a number of purposes, including a military prison, venue for carrying out politically-motivated executions and a military museum. Today the castle is in the process of being restored into a municipal space. As the castle is located at the pinnacle of the Montjuïc mount the views are particularly spectacular. Aside from the obvious (taxis, metros, buses or on foot), you may also want to consider one to the following means for getting to where you want to go on Monjuïc. This entry was posted in Barcelona and around and tagged Art, Barcelona, Caixa Forum, Castell de Montjuïc, El Grec Festival, Fundació Joan Miró, Funicular de Monjuïc, Gardens of the Greek Theater, Jardins del Teatre Grec, Josep Puig i Cadafalch, Mediterranean Sea, MNAC, Montjuïc Castle, Montjuic, Museu Nacional d'Art de Catalunya, Museu Olímpic i de l'Esport Joan Antoni Samaranch de Barcelona, National Art Museum of Catalunya, Palau Nacional, Plaça d'Espanya, Poble Sec, Teleferic de Monjuïc, Teleferico del Puerto. Bookmark the permalink.